50+ FREE TEMPLATES TO CHOOSE FROM! A. LG EzSign TV is a television that can also be used as digital signage. You can create and run your own messages on the screen in the form of a billboard while showing the Live TV programming. Advertisements, information and broadcast content can be arranged on the same screen to attract attention and deliver specific messages to your customers. 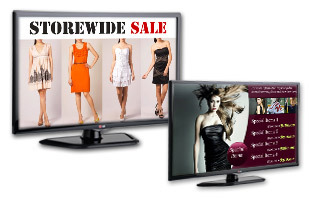 LG EzSign TVs are available in a wide variety of sizes, directly from Displays2go. These versatile televisions include stunning customizable templates with zoned content, or users can display their own full screen images or video. Many of the LG EzSign predesigned templates even include a live TV inset. We offer these televisions sold by themselves, but also with TV stands, so users can create a full digital signage system, without the headache of shopping for individual components. The LG EzSign TV is the perfect combination of an LCD flat panel and digital signage. This solution is perfect for those that are either hesistant of jumping right into full-fledged networked sign solutions, or those that really only need a simple plug & play option. The LG EzSign really consists of 2 distinct components, that end up marrying together to create your own unique digital signage display. The first is the television itself. All LG EzSign TVs are LCD displays, some of which even have LED backlighting, creating an ultra-thin panel (as thin as 1.2"!). The HDTVs (most are 1080p) have a USB port built right in. This is where the "Plug" from the term "Plug & Play" comes from. Each EzSign TV includes an invisible speaker system, so sound is heard, but not seen! They also include an internal TV tuner (most of the templates have live TV built in). The high quality LG EzSign TV is available in sizes such as 32", 42" and 55". The second component of the EzSign TV is the bundled software. 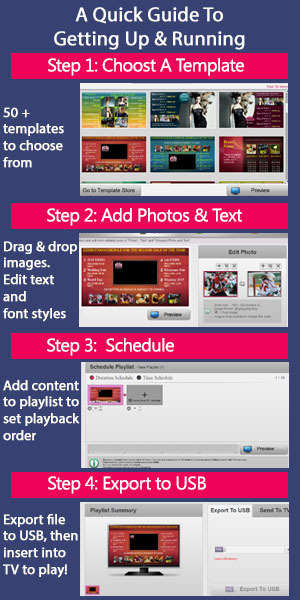 The program allows customers to create the perfect digital signage in just four easy steps! First choose one of over 50 templates. Next, add your own photos to the designated image zones. This is so simple: just upload files from your hard drive and drag into the appropriate zone. The LG EzSign accepts up to two images per zone, and it will automatically scroll between the two. Users can even set a scroll speed (choose from slow, medium, and fast). The third step with the LG EzSign software is to edit any of the text zones. There is a full spectrum of options available for text editing including choosing a font face, color, style (bold, italic, underline) and alignment. Finally, save your template and export it to your USB drive. Once the template has saved to the flash drive, unplug the drive and plug it into the rear of the EzSign TV. To send your template to the screen, use the included remote to easily navigate through the on-screen prompts. Aside from the exceptional functionality as a zoned content digital signage player, the LG EzSign also allolws users to play their own full screen content, without having to use one of the predesigned templates. This is limited to full screen images, but a graphically-inclined business person that has working knowledge of photo editing software such as Photoshop, can easily create a high resolution, visually-stunning advertisement. Videos can also be loaded onto a USB and played on the LG EzSign TV. Incorporating digital signage advertising into your business is a smart move! Electronic signs and dynamic advertisements are really the wave of the future, so why not hop on the surfboard now, instead of getting caught in the wake? Dynamic digital signage using LCD screens grabs the attention of your target audience much quicker than traditional print ads. Think about it, technology is quickly seeping into all facets of our lives. Teens and adults alike are practically glued to their smartphones on a regular basis. Do you really think a boring old printed poster is going to grab the attention of this audience? You need to join the movemement, not compete with it for the attention of your potential patrons, clients or customers. Q. IS IT REALLY THAT EASY AND SIMPLE TO CREATE AND RUN MY OWN CONTENT? A. Yes, you can easily create your own signage content using the free software and your computer. There are many free templates that are available for you to use. Choose the template that you want to use and add your own messages to that template. Save the file and transfer it to the TV using the USB flash memory stick to run it. It is that easy. Q. IS EzSignTV MORE COST EFFECTIVE COMPARED TO OTHER DIGITAL SIGNAGE PRODUCTS OR SOLUTIONS IN THE MARKET PLACE? IF SO, HOW? A. Yes, because you do not need to purchase the expensive software for creating your own content or the expensive media player to run the content you created. You also do not need to hire an expert to setup the content delivery system. Basically all you really need is your own computer to create the content and the USB flash memory stick to store and transfer them. Q. HOW DO I CREATE AND PLAY MY OWN CONTENT? A. First, install the software to your computer. After the installation, run it where you will see four easy steps of creating your own content. Step 1. From many available templates, choose the one that fits your need. Click next after you made your selection. Step 2. Upload the image that you want by browsing all the images that you have in your computer. Click on the image that you want to upload. The cropping, format changing and resizing will be done automatically. Step 3. Type in the messages that you want to add to the template. You can change the size and color. When you are finished you are ready to transfer that content to the HDTV. Step 4. 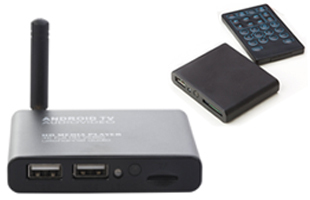 Transfer the contents to the USB flash memory stick and then insert it to the TV to run it. Select a preferred language, and click OK. When TV Editor Wizard appears on the screen, click NEXT. Select directory in which to install the program, and click Install. The program will be installed automatically. If Adobe AIR is not installed on your computer, an installation window appears. On the installation window, click Accept to install Adobe AIR. If the current version of Adobe AIR is already installed on your computer, click Close in the installation window. If you do not have the current version of Adobe AIR installed on your computer, click Update for a version update. Q. WHAT IS THE MAIN DIFFERENCE BETWEEN THE Ez Sign TV AND CONSUMER TVS THAT YOU CAN BUY IN RETAIL STORES? A. This TV has these special functions which cannot be found in consumer TVs and it comes with a two year limited warranty while typical consumer TVs come with only one year limited warranty. Digital Signage Capability: Free Software for making your own signage content. Public Display Mode: When used in public areas, these HDTVs can be easily programmed by the installer to have the TV turn on at a specified channel/volume level, set the minimum/ maximum volume, lock out the control panel/remote, set the aspect ratio, and return to a factory reset. By using Power Management, these displays can be programmed to turn off if there has been no activity (remote or control panel buttons) for a preset time (1-7) hours. USB Cloning: USB cloning will allow for easy transfer of Public Display Settings from the "Master TV" to an unlimited number televisions of same type and configuration. Q. IS IT POSSIBLE TO USE THIS TV IN A PORTRAIT MODE? A. No, it can only be used in a landscape mode . Q. HOW MANY TEMPLATES CAN YOU STORE TO TELEVISION? A. You can store up to six as long as the total combined file size is less than 10MBs and the version of software is 1.5 or higher. Q. HOW DO I QUICKLY SHOW THE TV PROGRAMMING ONLY WITHOUT THE CUSTOMIZED SIGN CONTENT? A. Push the "exit" button on the TV remote to disable Ez Sign content and push the "portal" button to run the Ez Sign content again. Q. IS IT POSSIBLE TO TRANSFER Ez Sign CONTENT VIA LAN? A. No, you can only transfer Ez Sign content using the USB flash memory stick. Q. WHAT TYPES OF IMAGE FILES ARE COMPATIBLE WITH THE TV? A. JPG, PNG, BMP, GIF files. Q. DO I NEED TO BE CONCERNED ABOUT THE IMAGE STICKING, SELDOM SEEN ON TVS IF YOU LEAVE THE IMAGE OR TEXT IN THE SAME SPOT FOR A LONG TIME? A. No because the HDTV has a feature to prevent image sticking where every hour, the direction of displaying the text message is automatically reversed for five minutes and resumes its original direction after that. Q. CAN I JUST USE THIS AS A MENU BOARD WITHOUT SHOWING LIVE PROGRAMMING? A. Yes, There are templates that you can use to show only your messages or a menu board without showing the television programming. Q. CAN I LEAVE THE USB FLASH MEMORY STICK IN THE TV FOR A LONG TIME? A. It really depends on the quality of the USB flash memory stick and the length of the time. However if you are planning to use the content for a long time, we strongly recommend to transfer the content to the HDTV and remove the USB stick. Q. WHAT TYPES OF USB FLASH MEMORY STICKS DO I NEED TO USE? A. You can use many types of USB flash memory sticks as long as they have at least 10MBs of storage space.